CHI Saint Joseph Health Partners connects providers, hospitals, ancillary services, skilled nursing facilities and agencies so patients receive the highest quality care at the best value. We bring together the whole spectrum of care by coordinating a team of providers to support patients’ health goals, patients experience better care and better health at a lower cost. The largest clinically integrated network in the Kentucky, we use the most sophisticated and secure technology to manage our patients’ care, improve compliance with evidence-based medicine guidelines, streamline payer contracting, and incentivize providers who show optimal performance based on quality metrics. CHI Saint Joseph Health Partners is uniquely positioned to make a real difference in the health of the people of Kentucky. We are leading the way in value-based care which measures, reports, and rewards excellence in health care delivery, and recognizes the long term solutions to disease management by understanding and managing the social determinants of health. Better health occurs when providers help patients engage in activities that optimize their health through preventive care, increased health knowledge and lifestyle changes. Patients experience better care when their health services are provided by a primary care provider who refers them, when necessary, to in-network specialists, and coordinates care with the entire health care team. Better experience means providing a care experience that is person- and family-centered, compassionate, convenient and safe. 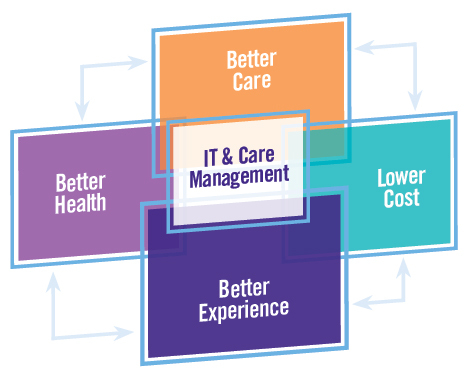 Lower cost is achieved when primary care services and care management tools are used to improve quality, reduce duplication of services and proactively manage chronic conditions.